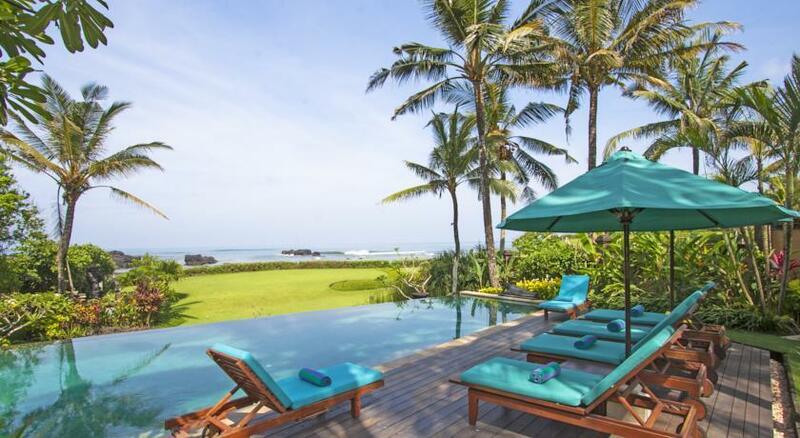 Set on a large rocky outcrop and the cloudy peaks of Gunung Agung to the north. 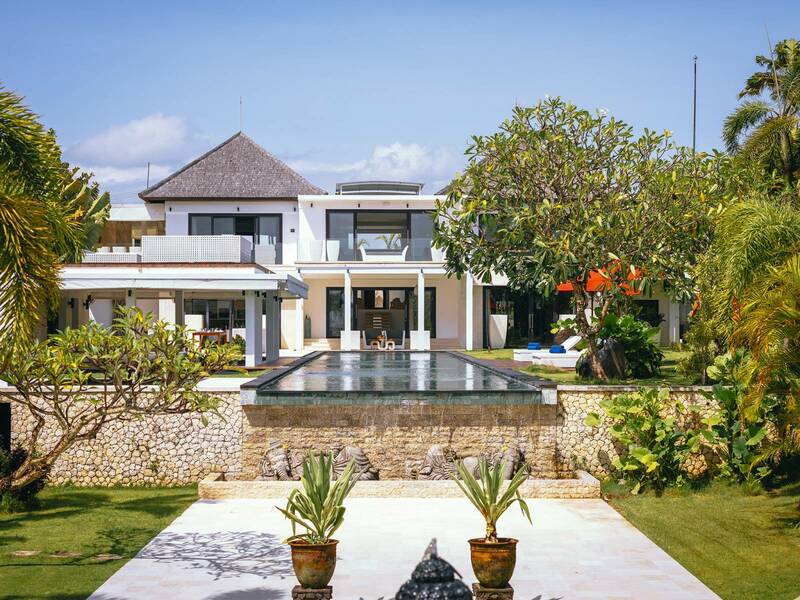 Set on 2,400 square meters of gently sloping grounds, studded with coconut palms and fragrant frangipani trees, with a crystal clear 15 meter x 4,5 meter lap swimming pool this home is a wonderful retreat, far from the gaiety of tourist Bali. 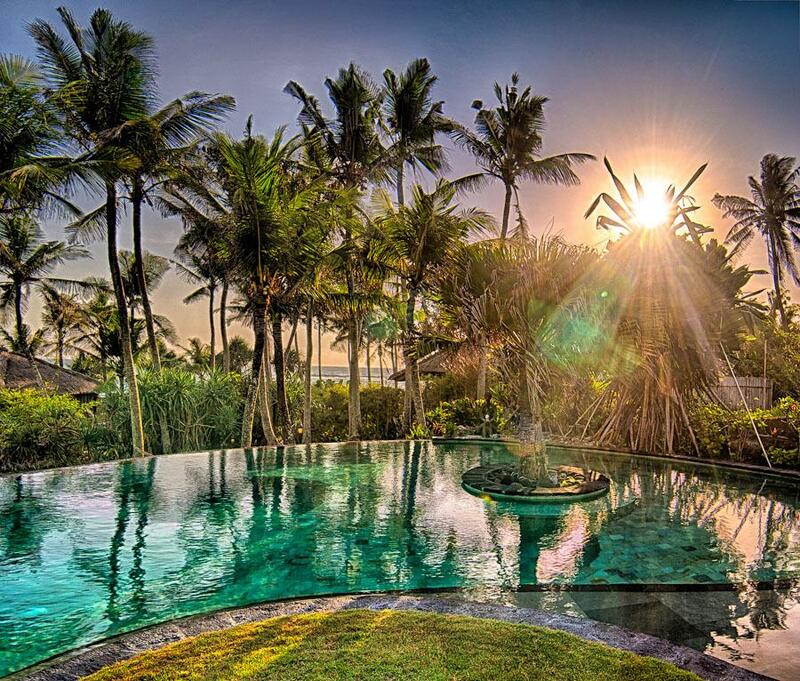 Views from the Villa take in the Hindu Temple in the Ocean to the South, sunset over the ocean to the west, volcanoes to the North and East. 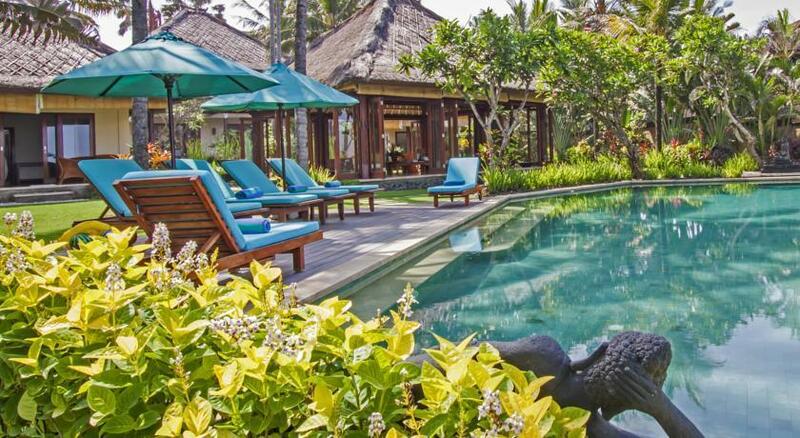 The villa was designed and built by PT.Triadi the same International Group who built the Four Seasons Hotel in Bali, and is refreshingly uncomplicated and simple in design with the sympathetic use of traditional Balinese architectural concepts and utilization of the best of local timbers and handcrafted stones and offers you every modern amenity. 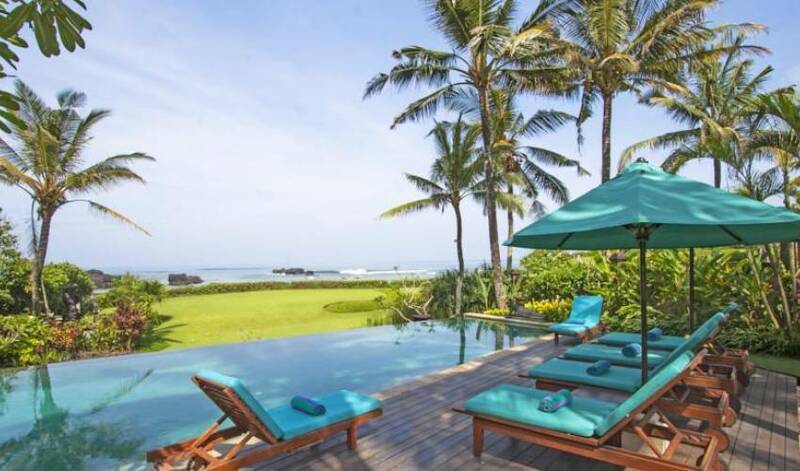 The Villa is only 10 minutes from the Greg Norman Designed Nirwana Golf Course and Le Meridian Hotels whilst equidistant from Bedugul and Nusa Dua Golf courses. 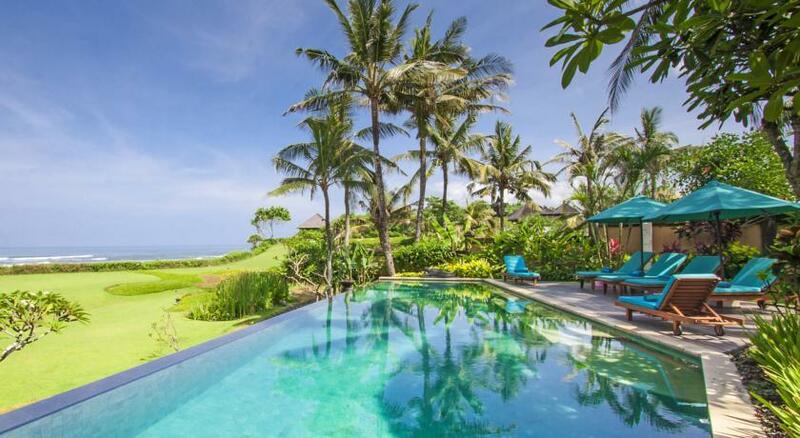 The approach to the Villa winds through Balinese villages surrounded by paddy fields and features ornate Balinese Temple and huge Banyan Trees. 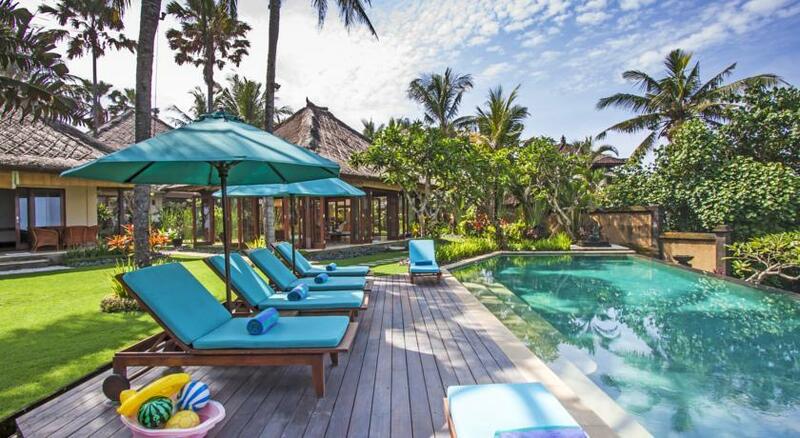 Only 30 minutes from the airport and 20 minutes from Legian and Seminyak, this villa captures the very essence of Bali and all its culture charm. The stunning 9 meter x 6 meter living pavilion with glass bifold doors and separate dining pavilion have been designed for relaxation and entertainment and provide optimum enjoyment of the wonderful ocean, river and unforgettable sunset views. 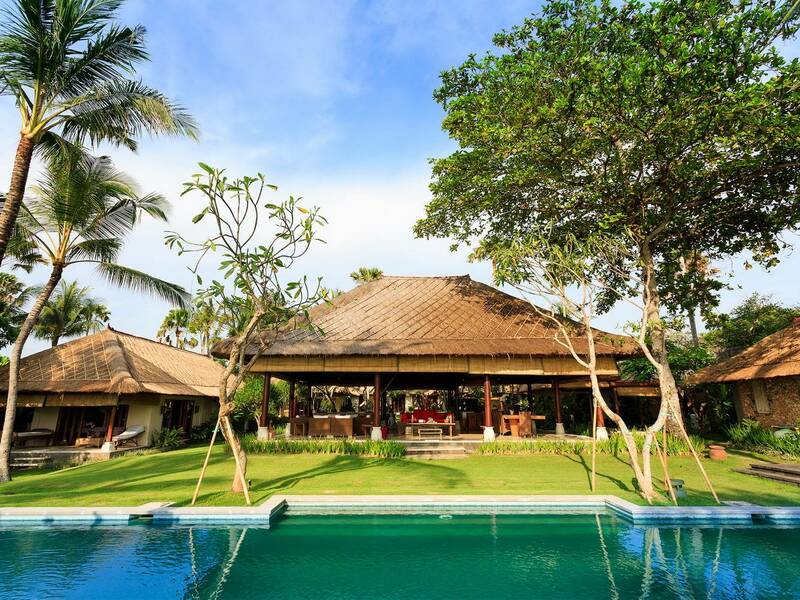 The pavilions with their high natural alang alang grass ceiling, the tall supporting coconut columns and the cool cream terrazzo paved floors are the very essence of tropical living. Overhead ceiling fans and gentle sea breezes keep everyone cool and the ample lounge area seating assures that there is room for everyone to relax. The lounge has a music system with surround sound speakers in the ceiling. The dining pavilion adjoins the open kitchen and both share stunning ocean views. A separate air -conditioned indoor study has a Television unit complete with VCD or DVD and Video systems. The grounds are beautifully grassed and maintained. 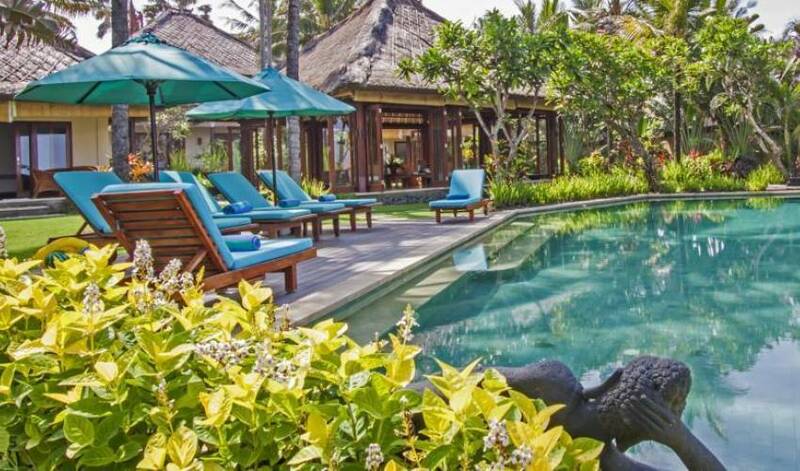 The wonderful 15 meter long swimming pool is lined with green stone with a white Palimanan stone surround. 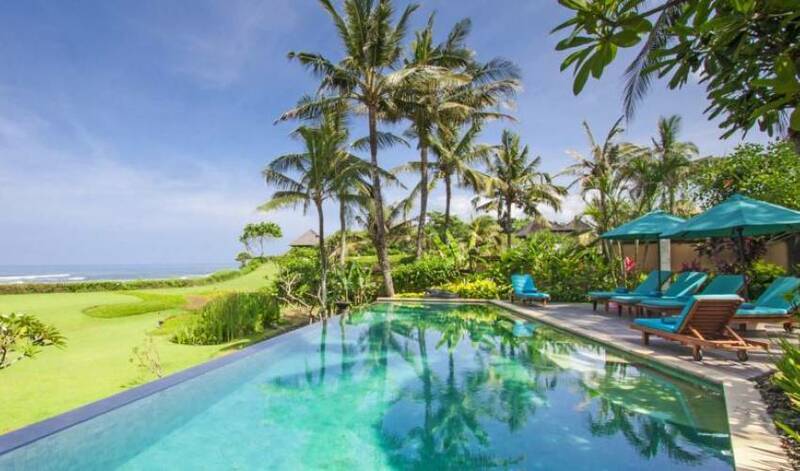 A swim in the pool, a surf at one of Bali's most popular surf beaches, a beach walk, a bike ride up to the village and its surrounds or a quiet fish at the rock pools all make for an unforgettable holiday. 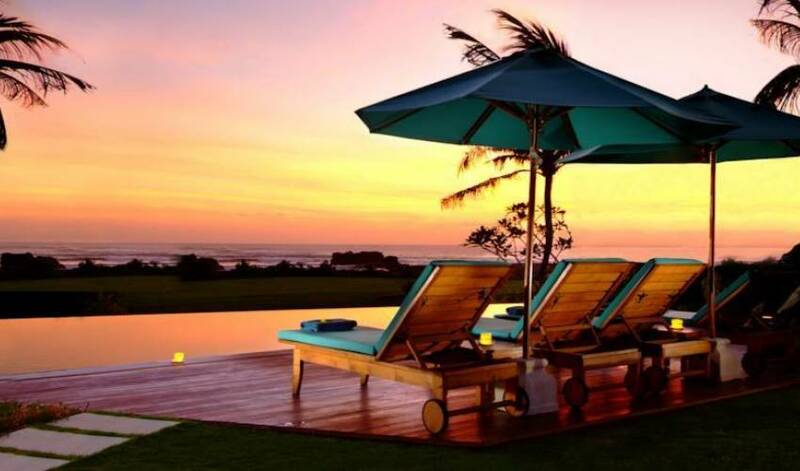 A special thank you for organising out stay at Villa 377 & 374. We had an amazing time & enjoyed every minute of our stay. The staff at our villa (377) were absolutely fantastic at looking after us. I may well be in touch with you for another holiday in the future. Was a great week. Lovely staff and overall a wonderful holiday. Everything worked perfectly. Will be coming back!! we are on the way back home to Austria after 3 amazing weeks in Villa 374. Saying good - bye was really very hard for us. We enjoyed our vacation very much and thanks to the wonderful and most friendly staff we could recharge our batteries on your beautiful Island. 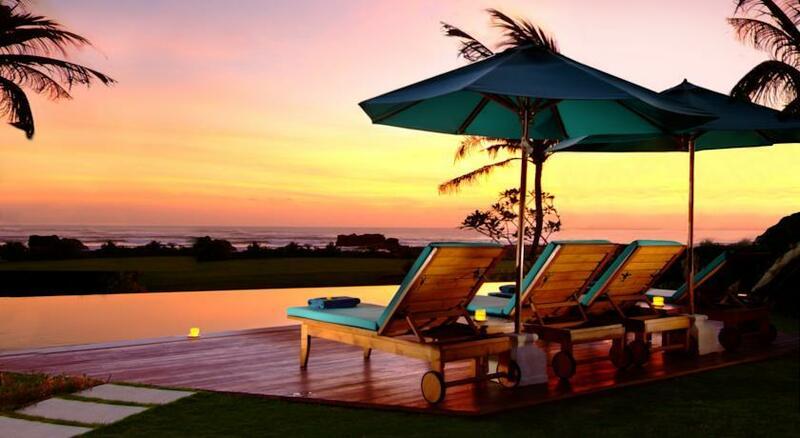 We just wanted to let you know that every single member of the Villa 374 staff was just so nice and helpful! The Chef Wayan is amazing - she is the perfect chef and a very nice person. We made some cakes together - it was real fun! Made, the driver, is not only a perfect driver, he is aswell a wonderful guide who has profound knowledge about history and nature of Bali. He gave us insight in the daily life of the local people AND he has a very good sense of humour. We were laughing so much during our trips on the island. I just wanted to give you this feedback and I hope this is helpful for you and for future guests of enchanting Villa 374.